Foundation scholarship applications for the 2019 – 2020 academic year are now available. The priority application deadline is March 8, 2019. A number of scholarships are available to you through the Board of Trustees, the College’s Foundation, and from outside contributors. Application procedures and deadlines vary. Many scholarship applications require you to write an essay. Tips for writing a scholarship essay are available from the Writing Center. Owens College Credit Plus (CCP) students have the unique opportunity to continue on the academic path they have started at Owens Community College to earn their associate degree or certificate and enter the workforce or transfer to a four-year college or university. The Start Here Scholarship will cover instructional fees for eligible students and is renewable if criteria are met. Click here for answers to Frequently Asked Questions. Be an Ohio resident for the duration of the scholarship. 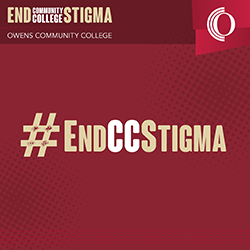 Be a high school senior graduating in Spring 2019 who has earned at least nine credits at Owens through the CCP program. Apply to Owens Community College, have an Owens CCP cumulative grade point average (GPA) of 2.75 or higher, and a high school GPA of 2.75 or higher. Submit a complete Free Application for Federal Student Aid (FAFSA) to Owens for each academic year. Enroll in 15 credits for Fall 2019. Be a regular, admitted student with the intent to obtain a certificate or an associate degree for the duration of the scholarship. Students who qualify will automatically receive the scholarship to pay for instructional fees not covered by other aid, such as the Federal Pell Grant or other scholarships. In addition to the requirements above, students must also meet the following to receive the scholarship in future semesters. Maintain an Owens cumulative grade point average of 2.5 or better. Earn a total of 27 credits at Owens during Fall 2019, Spring 2020, and Summer 2020. Be continuously enrolled each semester, except for summer, which is optional. Enroll in 12 credits for Spring 2020, 12 credits for Summer 2020 (optional), and 9 or more credits for the remaining semesters. Students whose academic program does not allow for the required hours of enrollment should contact their Advisor for assistance. The scholarship ends after three years, or once the student has earned 64 credits at Owens. Start Here Scholars will receive priority registration for future semesters. Start Here Scholars will receive VIP access to Owens academic and student support services including special meeting times with advisors, Oserve representatives, tutoring mentors, and more. The Start Here Scholarship covers instructional fees only. Students may be responsible for books, general fees and any additional fees depending on the chosen program of study. The Board of Trustees Scholarship is $1,000 per semester for up to four consecutive semesters. The scholarship begins in fall semester; summer enrollment is optional. All awards are based upon available funding. Students who will be enrolling at Owens in the fall semester immediately after graduating from a high school in the Owens legal district, and who have a high school GPA of 3.7 or above, must submit official high school transcripts on or after January 1 of their senior year to be considered. In addition, students who meet one of the following qualifications may apply for the scholarship by submitting the Board of Trustees Scholarship — Nomination Form. A high school senior attending a high school located in the Owens legal district, who has a high school GPA of 3.0 – 3.69, demonstrates student motivation, and enrolls in the fall semester immediately following high school graduation. A high school graduate, who has not been in high school for at least one year, or a GED recipient (applicants may not have attended Owens for at least one year); resides in the Owens legal district; demonstrates motivation through exceptional work or public/community service (including military service), academic performance, other demonstrated leadership, or other experience as related to a career path; and enrolls for the fall semester immediately following the award of the scholarship. The Owens Community College Foundation offers a variety of scholarships through the generosity of businesses and individuals in the community. Scholarship award notifications begin in mid-spring and will continue until all awards have been made. For more information on Foundation Scholarships, contact the Foundation Office at (567) 661-7603 or 1-800-GO-OWENS, ext. 7603. Click here for College Foundation Scholarship details. The Owens Scholarship is awarded to selected students in the John Deere Tech Major who are paying out-of-state tuition rates. The Vice President of Academic Affairs selects recipients and determines scholarship amounts. Funds may be awarded on a limited, case-by-case basis to students who do not meet this criteria. The Student Leader Scholarship is provided to the President, Vice President, Secretary, and Treasurer of Student Government; and to the Editor and Assistant Editor of The Owens Outlook, unless these positions are held through student employment. Annual award amounts range from $375 – $1000, depending on position, and can be used for instructional expenses. The Success Tuition Assistance Program covers institutional and general charges not covered by other financial aid, such as the Federal Pell Grant, for students who graduated in Spring 2014, 2015, or 2016, from one of the schools listed below. The program will no longer be available for students who graduate after Spring 2016. Students must submit a final official high school transcript showing high school graduation with a high school grade point average of 2.5 or higher, complete a Free Application for Federal Student Aid (FAFSA), be charged in-state tuition rates, and meet financial aid and other eligibility criteria to qualify. Student must also meet or exceed the following English test scores: (a.) ACT Writing 18, plus ACT Reading 22, or (b.) Compass Writing 69, plus Compass Reading 78, or (c.) Asset Writing 41, plus Asset Reading 37, or (d.) Accuplacer WritePlacer 5, plus Accuplacer Reading 80. The College and the Foundation reserve the right to change the program’s requirements at any time. Owens Community College offers Tech Prep scholarships to graduating high school seniors who have participated in a Tech Prep career pathway within the Greater Northwest Ohio Tech Prep Consortium. The maximum award is $2,000 total ($1,000 per year) or $500 per semester for four semesters to cover tuition, fees, and an allotment for books that are not covered by other financial aid, such as the Federal Pell Grant, as long as the student maintains eligibility. This scholarship does not pay for supplies, lab fees, course fees, and other institutional fees. Students must obtain the Tech Prep Scholarship Application and complete it in order to be considered. The 2019-2020 deadline for the application and all documentation is June 28, 2019. Have instructional and general fee charges which are not being paid by other financial aid, such as the Federal Pell Grant. The Ohio National Guard Scholarship Program provides tuition assistance to qualifying members of the Ohio National Guard who are enrolled in at least three credit hours per semester. Additional information is available online. For Summer 2018, the scholarship will cover 96% of instructional and general fees; Owens will cover the remaining 4% with the Owens Community College Grant. Beginning Fall 2018, the scholarship will cover 100% of instructional and general fees. Children (up to age 25) of deceased or severely disabled Ohio veterans may apply for the Ohio War Orphans scholarship. Veterans must have served a minimum period of active duty in the armed services during a declared conflict or war, as designated on the scholarship application. The scholarship provides payment of 84% of instructional and general fees for the 2018-2019 academic year. Students must attend full-time (12 credit hours or more). Applications are available through high school guidance counselors and the Ohio Department of Higher Education. The application deadline is July 1 for the upcoming school year. Forms are available online at the Ohio Department of Higher Education website. This program provides tuition assistance to the children and spouses of peace officers, fire fighters and certain other safety officers who are killed in the line of duty. It also provides assistance to qualifying children and spouses of members of the U.S. armed services who were killed in the line of duty. Students must be Ohio residents and be enrolled full or part-time at a participating Ohio college. Interested students should contact the Department of Higher Education. The Education Training Voucher (ETV) provides assistance to youth who have emancipated from foster care or were adopted at the age of 16 or older and who are enrolled in post- secondary educational programs. The young adult must have a high school diploma or GED to be eligible. Funding can be used to assist with tuition, books, computers, school supplies, living expenses, rent, childcare, health insurance, groceries and transportation. Young adults enrolled in the ETV program and reach their 21st birthday may continue receiving vouchers until their 23rd birthday as long as enrollment into the program is progressing toward a satisfactory completion of that program. More information, including how to apply for this scholarship, can be found on the Jack Kent Cooke Foundation Undergraduate Transfer Scholarship online at https://www.jkcf.org/our-scholarships/undergraduate-transfer-scholarship/. The application is available beginning in early October each year. Through the generosity of many individuals, families and businesses, scholarships are awarded on an annual basis from philanthropic funds which have been established with Toledo Community Foundation. These awards assist local students in their pursuit of higher education. For more information, including how to apply, visit www.toledocf.org and click on Scholarships. Most deadlines are in early February for the upcoming academic year. The Findlay-Hancock County Community Foundation has an extensive scholarship program for area students. The online scholarship application, instructions and deadlines are available on their website at www.community-foundation.com. Information on outside scholarship opportunities is available in Oserve. Eligibility, application procedures and deadlines vary. There are numerous free scholarship searches available to you, such as the ones listed below. You should avoid scholarship searches or applications which require a fee. Click here for more information on how to spot potential scholarship scams.